“In fact, pets probably rack up medical bills as fast as any Olympic competitor; every six seconds a pet parent is handed a vet bill over $3,000! ** For animals and athletes, good preventive care is key. And it never hurts to have a little help paying the bills,” said Petplan co-CEO Natasha Ashton. Our furry friends have more in common with Team USA’s best competitors than you think. Petplan pet insurance says cold-weather warriors can be slipped up by many of the same health conditions, whether they’re on two or four legs. Physical profile: Immensely active and strong, yet agile enough to maneuver on any terrain. Physical profile: Graceful showman with a compact build and athletic ability. Physical profile: Possesses power and athleticism. Rugged and tough, but still agile. Physical profile: A great athlete who understands teamwork, can move fast and go all day long. As Petplan’s pairings highlight, the talent to play hard and take on anything isn’t the only thing linking our pets with Olympians. 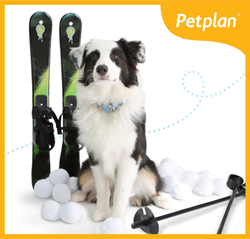 For info about Petplan and more fetching pet facts, point your paws to http://www.gopetplan.com. *Average costs based on 2017 Petplan claims data. **Source: 2014 Petplan claims data. Petplan policies are underwritten in the U.S. by XL Specialty Insurance Company and in Canada by XL Specialty Insurance Company - Canadian Branch. The company is rated A+ by S&P (2018). Coverage may not be available in all jurisdictions. For more information about Petplan pet insurance, visit http://www.petplan.com or call 1-866-467-3875.